An okay movie that really doesn’t give us much that we haven’t already seen before. Here’s a movie that makes no attempt, whatsoever, to be anything creative or original. It’s based on a story that has been told time and again, and is even a remake of a classic film itself, but this one adds nothing new to the story or ideas. The characters are one dimensional and the story is basic. And yet, the action is pretty decent, which is really the only thing that makes this movie watchable. That and the likeable cast, which really just offers up the promise and potential of what might have been. 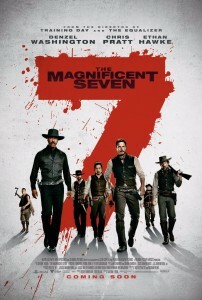 The Magnificent Seven is a remake that really didn’t need to be made. I say that being fully aware that the original film with Steve McQueen and Yul Brenner is a remake of sorts of the Akira Kurosawa Japanese film The Seven Samurai. And I’m also aware that there have been plenty of excellent variations of the story over the years, such as the comedic version The Three Amigos. But the Denzel Washington movie offers nothing new of any kind, and therefore is an absolute waste. Here’s the thing. There’s no point of remaking a movie unless you can make it better. And if you’re not sure if you can make it better, then at least make it different. Add something new, not only to the original movie, but also to the genre. Give us something that we haven’t seen before. This could be a creative twist in the plot, some new way of looking at a character, or even a clever stylistic move. Just something to show that there was a reason for this movie to be made. The Magnificent Seven remake offers us absolutely nothing new. Now, let’s get something clear. It’s not a bad movie. It’s not like you’re cringing here, or waiting for this thing to end, or anything like that. It’s just that the movie is insignificant. It’s exactly like a thousand other movies that came before it and doesn’t even attempt to show us anything different. I mean, at least show us something about the men’s homes and lives outside of the job. Show us what they have going on for them other than the job, that might explain why they would be taking on something like this (for family, wives, future dreams.) The closest we get to any of that is learning that Chris Pratt’s character, Josh Faraday, is taking the mission to win back his horse. Not much of a look inside the character with that one. The movie stars Denzel Washington, a super-talented actor who usually picks his projects well. But this time it’s more about reteaming with friends on a passion project of a classic movie he and the director both love. That director is Antoine Fuqua and the movie also stars Ethan Hawke. The last time these three worked together was on Training Day, and it won Denzel an acting Oscar. It also brought Fuqua into the limelight as a director and got an acting nomination for Hawke. So it’s nice to see the three of them working together again, but they sure could have picked something better than this. Especially considering how fresh and original Training Day felt. But this time around, the boys are simply remaking a movie they all have affection for without changing anything of importance. It’s a wasted opportunity that should have been something cool. The last time this sort of thing was attempted, it was Gus Van Sant remaking Psycho, and boy was that a mess. That movie nearly destroyed Van Sants career. 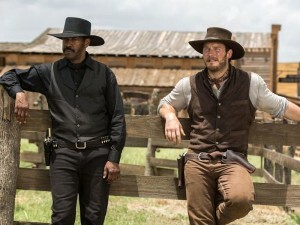 In the case of the Magnificant Seven remake, things aren’t quite that bad. After all, it is still an action movie, and despite everything else, the action is pretty decent. And it’s not going shot for shot like that movie did either. But the idea ogre making just because of being a fan is not enough, and doesn’t get the movie very far. Regarding the storyline, this one really isn’t that good. It opens with us meeting the villain, a wealthy baron named Bogue (Peter Saarsgard,) as he threatens people for their land. Now he’s willing to pay them for it, (less than its worth, of course,) but if they don’t accept his offer, he plans to take the land anyway. He even burns down the church to make his point. We’ve seen worse. Much worse. We’ve even seen worse church burnings, like in The Patriot, where people were locked inside of the church before it was burned down. The first portion of the movie is really just about introducing and meeting each character as they are recruited, one by one, to join the team. There isn’t a single one of these meetings that is memorable or stands out. Even the character who looks the craziest, played by Vincent D’onfrio, doesn’t have anything to make him really all that interesting. The same goes for Ethan Hawkes character, as well as all of the others. The me ride into town and have a face to face with some of Bogue’s men, who were left there to make sure things go the way Bogue would like. When the confrontation turns violent, we get our first real action scene. It’s about halfway into the movie at this point, and finally we are getting some action. It’s a pretty good scene, with each of our characters getting involved, and it gives the promise of more to come. And we get that later on. Some of Bogues men are sent back to Bogue to give him the message about what happened there. Now Bogue puts together a mini-army of his own to attack. While that’s happening, our seven heroes get ready, training the people of the town. And then we get the big action climax where Bogue’s men arrive. The action is good, (including the use of s giant gatling gun,) the story is not. This is paint by the numbers stuff, and it doesn’t even attempt to go any deeper. The Magnificent Seven remake is a very simple and basic movie. It’s made to look nice and have some fun with the action, but nothing more. There are no attempts at intelligence or creativity to the writing that went into this. The story is a quick connect the dots, three act structure. The men get recruited into a team, they ride into town to send a message to the villain, and the villain puts together his own army to challenge our heroes for the climax. Considering how simple it is, the movie deserves credit for still holding our attention. It does this by having some lively action, and a very likeable cast. Look at the Ethan Hawke character, for example. The story about him uncertain of his skills and whether he still has them anymore is pretty dopey, but when you see the crazy return to his eyes (and his laugh,) during a gun battle, you are intrigued. It’s not enough to make this movie worthwhile, but it’s little things like this that help to hold our attention. If only the movie had tried a little harder to be somewhat creative.